Today you embark on your journey to Spain! You'll arrive in Barcelona this morning and be met by your driver at the airport to take you to your hotel. 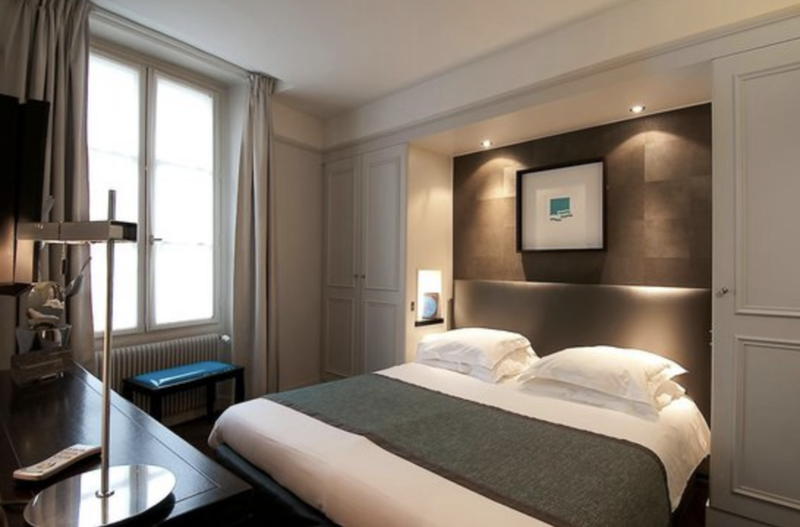 After checking into your hotel, start exploring the city! Like many other cities on the Mediterranean, Barcelona was founded by the Romans. The original settlement, called Barcino, was a small port located on the same spot as today’s cathedral. The town was overshadowed by Tarragona, the capital of the province. Both the Visigoths and the Moors invaded Barcelona; however, their influence was not as important to the future of the city as the arrival of the Franks in the late 9th century. It was at that point that Barcelona and Catalonia started shaping their own identity, different from the rest of Spain. Barcelona’s history is seen everywhere in the city. The oldest areas are located by the sea, including the shopping enclave Barri Gotic. On the other side of the main boulevard, La Rambla, lies the legendary Raval district. Until the 1980’s this was the slum area, home to the city’s own Chinatown (Barrio Chino) and the red light district. Today, designer shops and cafés have moved in. Further north is fashionable Eixample, the area created as a result of the 19th century expansion of the city. Much of the attraction of Barcelona is the city’s wide range of sights. The architect, the design nerd, the football fan, the art historian, the city planner - there is something for all of them in the most self-assured city on the Mediterranean. A visit to Sagrada Familia, Casa Mila and Casa Calvet is a must when visiting Barcelona. This morning, you'll check out of your hotel and find your way to the train station. 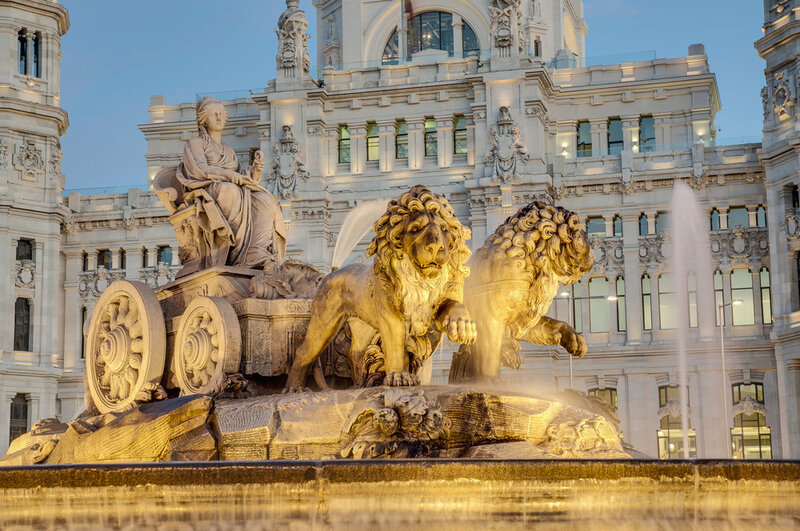 When your train arrives in Madrid, check into your hotel and explore the city! Madrid is a wonderful city that inspires casual strolls around green areas and frantic nights of adventure. People fill the streets at every hour of the day and there are impressive buildings, lush parks and picturesque streets in abundance. Culture is ever-present here, and you don't have to be a history buff to appreciate the architecture and constant reminders of a long and rich history. Greet your courteous guide at a conveniently located pickup point in central Madrid, and climb aboard a comfortable, air-conditioned bus destined for Toledo. While admiring the scenic Catalonian countryside, receive an interesting introduction to the history of each region before arriving in the UNESCO World Heritage-listed city of Toledo. Embark on a guided walking tour of the medieval city’s arresting landmarks and serpentine streets, visiting the Mirador del Valle, the Cathedral of Toledo and the Monastery of San Juan de los Reyes. After thorough exploration, return to your vehicle, and continue onward to Segovia, a Roman city shrouded in history. On arrival, witness the architectural splendor of the ancient aqueduct, a Roman structure. Next, marvel at the boat-shaped structure of El Alcazar, one of the most distinctive palace-fortresses in Spain, and then absorb the Gothic grandeur of the Cathedral of Segovia. Suitably impressed, return to your vehicle, and relax during the journey back to central Madrid, where the tour concludes. 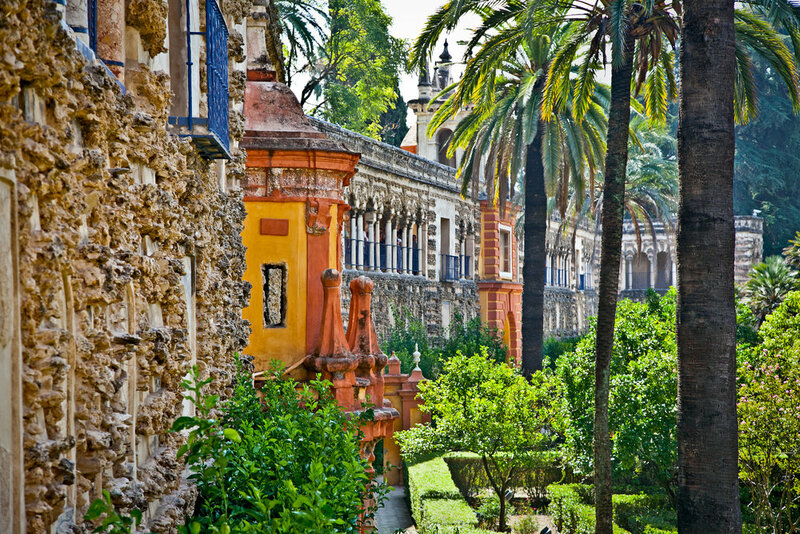 When your train arrives in Seville, check into your hotel and explore the city! The Phoenicians arrived in this area first, establishing a number of trade colonies by the river. They taught the locals how to work with iron and created a new way of processing gold. The Romans came next and founded the town of Hispalis a few hundred years BC. Hispalis grew into a beautiful and prosperous city, but it never managed to emerge from the shadow of nearby Córdoba, until the Visigoths transformed Hispalis into a provincial seat and a centre of learning. In the 11th century, the Moors captured the city and re-named it Ishbiliya, but they too chose to make the grander city of Córdoba their capital. They even named it the Córdoba Caliphate. After almost 400 years of civil war battles between Christians and Arabs, the Moors withdrew from their beloved Al-Andalus. Soon after, the inhabitants of Seville finally struck gold. When Christopher Columbus discovered a new continent in 1492, the exclusive trade rights were given not to Córdoba, but to Seville. The city quickly became the wealthiest and most cosmopolitan city in Europe, and retained that position for several hundred years. This eclectic mix of influences over the centuries have shaped the city we see today, and Seville's fascinating history is visible at every turn. A mixture of culture, monuments, flamenco, narrow streets, The Roman Ruins of Hispalis, bullfights , parks, tapas, etc in resume: All of Seville guided by a NATIVE Licensed Official Tour Guide. Your guide will provide you with a map of the city and mark the important places (monuments, tapas bars, Workshops, etc) which make for easier the exploration of the city on your own. River Bank (including a River Cruise ride ). Roman Ruins of Hispalis (Anticuarium) right at the wonderful contemporary Metropol Parasol. Settle aboard your air-conditioned coach and admire the rugged Andalucian countryside as you journey to Granada. Along the way, hear an introduction to your destination’s history, and learn how your route is the same as the one taken by the 19th-century American essayist Washington Irving, author of the famous Tales of the Alhambra. Catch glimpses of the Alhambra Palace on your approach to Granada and, on arrival, enjoy a guided walking tour of this UNESCO-listed gem. Bypass the entrance lines with your skip-the-line ticket, and enjoy priority access to its main attractions, including the Alcazaba, Nasrid Palace, Generalife Gardens and Palace of Charles V. A vision of Moorish architecture and art, this exquisite complex dates back to the 13th century, and was built as a royal city, court and retreat for Spain’s Moorish rulers. Admire the Court of Lions and Hall of the Ambassadors, and stroll around the enchanting courtyards, fountains and pavilions as your guide shares details of their history. Next, drive to the center of Granada to enjoy lunch (own expense). Then, take a guided walk of the UNESCO-protected Albaicin quarter, Granada’s old Moorish district. Stroll down the narrow streets past whitewashed houses, churches, gardens and flower-filled balconies, and stop to take in the area’s spectacular panoramas over the hilltop Alhambra. Afterward, hop back in your coach and drive back to Seville where your tour finishes at the start point. This morning, you'll check out of your hotel and find your private driver waiting for you in the lobby of your hotel. When you arrive in Lisbon, check into your hotel and explore the city! Lisbon’s heart lies beside the river, even if the city has grown in all directions. Sit down at a pavement cafe on Rossio Square and you will see the Baiza, the flat city centre that dates from the 18th century, between yourself and the river bank. Look up in one direction and you will see the São Jorge on the top of a hill. Look in the other direction and you will see the ruin of the Carmo Church on another hill. Walk, or take a tram to one of them and you will discover the quarters of old Lisbon, most of them with a magnificent view of the rest of the city and the river. Wander north from Rossio, you will soon end up on a stately 19th century avenue, in the part of the city which is still called "Avenidas Novas". Further north, the buildings become really new, with the city’s two large football grounds, Luz and Alvalade, and, lastly, the airport which is twenty traffic-jam-free minutes in a car from Rossio. Most of the best sights, restaurants and nightlife are situated along the river. Shopping is good along the Avenidas Novas, but otherwise the rule is to keep close to the river to get the best out of your visit. Your full-day tour of the Sintra region begins with pickup at your centrally-located Lisbon hotel, where you'll climb aboard a comfortable tour vehicle and meet your guide for the day. Head for Pena Palace, which sits on a hilltop with a view of Sintra National Park and the Atlantic Ocean. Learn about the 19th-century Romantic style of the palace, then continue through Sintra National Park to see the flora and fauna, the Chalets, the Montserrate Palace and the Moorish Castle. Take an optional visit to Quinta da Regaleira (ticket at own expense), stroll through the exotic gardens and hear about the mysticism wrapped up in the secret wells, caves and Masonic architecture. earn about the alchemy behind the architecture and art, with origins in the Templars, the Rose Cross, and the Masonry. At Cabo Roca, snap some photos on the westernmost point of Continental Europe and stroll the beaches at Guincho. Spend some free time in Cascais, a former vacation destination for the Portuguese Royal family. Fatima is a town and Parish located 142 km (88 miles) North of Lisbon. Fatima is one of the most important catholic shrines in the world dedicated to the Virgin Mary. Fatima’s Sanctuary welcomes millions of pilgrims and tourists from all over the world. Fatima’s fame is due to the Apparitions of Our Lady of the Rosary that appeared to three shepherd children; Lucia dos Santos and her two younger cousins, Francisco and Jacinta. Between May and October of 1917, the three children witnessed several apparitions. The last one, on October 13th, was confirmed by a miracle witnessed by 60,000 people known in the catholic world as “the day the sun danced”. Fatima now attracts thousands of pilgrims from all over the world, particularly on the pilgrimage days in May and October. The large torch-light processions in the evening are particularly impressive, often lead by Cardinals and Bishops. The pilgrims gather in Cova de Iria an enormous plaza where a little chapel was built and where the Virgin Mary is believed to have appeared to the children. Around the plaza are a considerable number of shops and stalls selling various religious articles. On the far side of the plaza rises the great basilica, built in the in neo-classical style, with a central tower 65 meters high, the construction of which was begun on 13 of May 1928. It is flanked by colonnades linking it with the extensive convent and hospital buildings. In the basilica are the tombs of two of the three visionaries, siblings Francisco and Jacinta Marto, who died in 1919 and 1920 respectively, and were beatified in 1970. The third seer, Lucia dos Santos, died in 2005. When your train arrives in Porto, check into your hotel and explore the city! In Porto there is so much to see and do, and its beautiful surroundings are particularly spectacular. Make sure to visit the port wine caves, different markets and many museums. 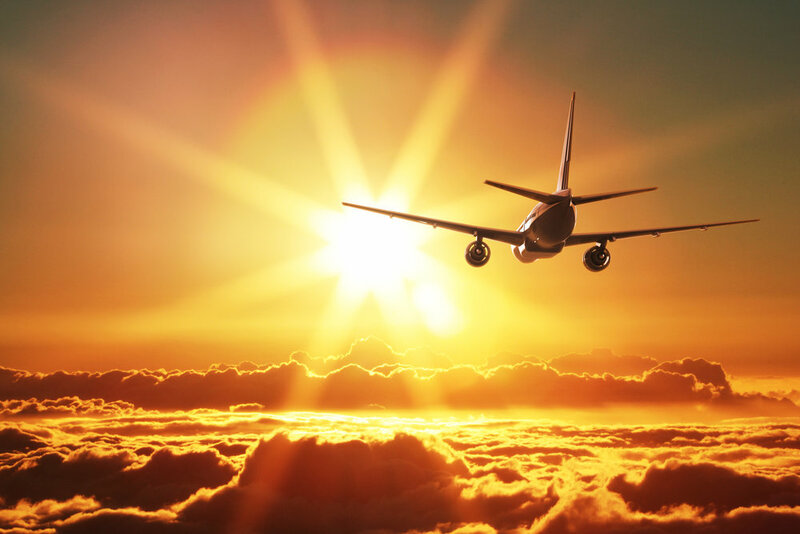 Today, you'll depart from Porto and board your plane for home. *payment schedule does not include insurance costs. Insurance is due with initial payment.